This book brings together 14 personal accounts from survivors of Japanese POW camps. From these diverse accounts much can be learnt of camp life and what the POWs went through on a daily basis. We are taken to the Sumatra railway, the Burma railway, the copper mines at Kinkaseki, and hosts of other, lesser-known places where the internees had to work unremittingly. How anyone survived these places is a wonder in itself. We learn also of the daily allowance of food. One survivor tells of how he was down to three tablespoons of cooked rice a day. His weight went from 10 stone 6lb to 5 stone 3lb. "When we had a day off mining we were given a so called treat - a meal of fish intestines and seaweed, every day maggots were in our rice but we had to eat it or else starve." We get an insight into the woman's camps, where boys were allowed to stay until they were 11 years old - then off to the men's camps. One account is written by someone who was a boy at the time of war. He describes how at first he was in a camp with his mother and sister, but upon reaching the age of eleven he was transferred to the men's camp. His account is an amazing story of courage and boldness, especially when at the end of the war he sets off to find his mother again after two years apart. 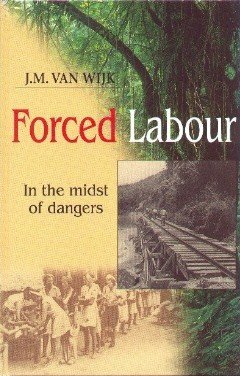 Two chapters concentrate on the invasion itself, mainly in respect of the Dutch East Indies, but give a good idea of the conflict overall. This book is a direct translation from one available in Dutch. The accounts are from eleven Dutchmen and women and three English people. For anyone who wishes to know more of this conflict from the side of the POWs this book is a must.